Special Bundle Includes an Adorable Chibi-Robo amiibo Figure. When Earth’s resources are in danger from a mischievous group of aliens, there’s only one robot with the skill to save the world! That robot’s name is Chibi-Robo, and he’s the star of the energetic new game Chibi-Robo! Zip Lash, launching exclusively for the Nintendo 3DS family of systems on Oct. 9. Chibi-Robo might be small in size, but his adventuring skills are as big as the most intrepid explorer’s! Using his plug and cord, Chibi-Robo can whip, grapple and swing his way through a huge side-scrolling platformer filled with dangerous enemies and clever environmental puzzles. And by scanning the Chibi-Robo amiibo figure that is included with a special bundle, players can access bonus features like the ability to power up to Super Chibi-Robo, increasing Chibi-Robo’s speed and watts and allowing him to travel for longer distances without having to charge up. Chibi-Robo! 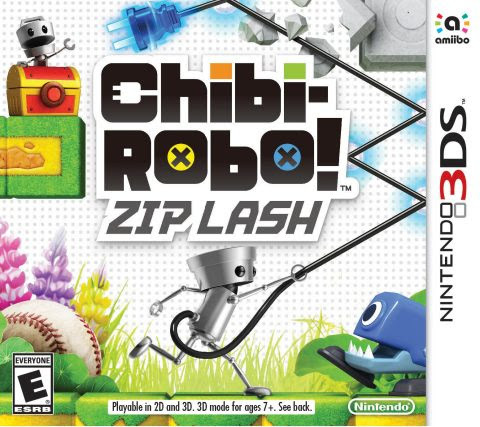 Zip Lash takes the much-loved Chibi-Robo series in a new direction. While previous games focused on completing chores in a third-person 3D environment, this new Nintendo 3DS game is a classic side-scrolling adventure with a strong focus on discovery and exploration. In the game, Chibi-Robo travels through a variety of action-packed environments. Using his signature plug and cord, he can whip enemies, swing over chasms, ricochet shots and grapple to scale walls. By collecting boost balls, his cord can be extended, allowing Chibi-Robo to access previously out-of-reach areas and search for a variety of different collectibles, including many surprising real-world snacks. The game is overflowing with tons of collectibles to find, bosses to battle and hidden areas to discover. In addition to activating Super Chibi-Robo, players can use a Toy Capsule Machine by scanning the Chibi-Robo amiibo to the New Nintendo 3DS system or Nintendo 3DS, Nintendo 3DS XL or Nintendo 2DS systems using the Nintendo 3DS NFC Reader/Writer accessory (sold separately). This fun machine, located in the Chibi-House, can only be accessed using the amiibo figure and unlocks delightful items like collectible figures and bonus stages. Players can even level up the Chibi-Robo amiibo itself by recording in-game score data. The higher the level of the amiibo, the more times the player can become Super Chibi-Robo each day during game play and the better chance the player will receive rare items from the Toy Capsule Machine. Chibi-Robo! Zip Lash will launch in stores, in the Nintendo eShop and at Nintendo.com on Oct. 9 at a suggested retail price of $29.99. Players who want to also purchase the Chibi-Robo amiibo can find him in a special bundle that includes the game and amiibo figure at a suggested retail price of $39.99. For more information about Chibi-Robo! Zip Lash, visit http://chibirobo-ziplash.nintendo.com/.